tako is a command language and shell for GNU/Linux (and Mac OS, and Windows via Cygwin or MSYS2), based on Python (version 3) and GNU Bash, and forked from xonsh. tako is not "sh"-compatible, but rather is designed to provide an intuitive interface for common shell operations (to reduce time spent looking up how to do things in Bash/sed/awk). There are three equally valid ways of looking at tako: it is a shell with a sane scripting language, and/or it is Python with extra syntax to make running external commands easier, and/or it is a stripped-down version of xonsh (you can see some of the differences here). You can download the associated JSON file (107 KB) and play it locally using asciinema-player. Yes! tako is free/libre software, available under the terms of the GNU General Public License version 3+ . Instructions for downloading and installing tako are available on the Download/Install page. 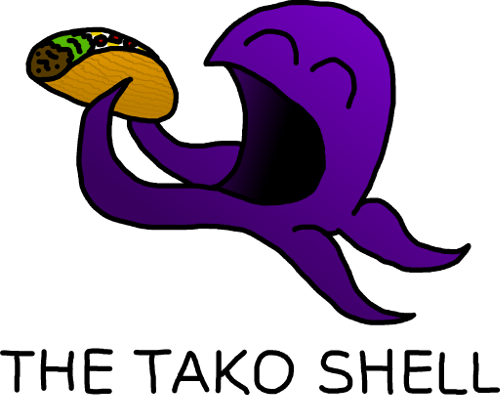 You are also free to use the tako logo (the octopus eating a taco), which is available under the Creative Commons BY-SA 4.0 license. It is also available in a larger size. tako is a fork of xonsh, and so substantial pieces of xonsh (v.0.3.4) are included. tako ships with Python Lex-Yacc.